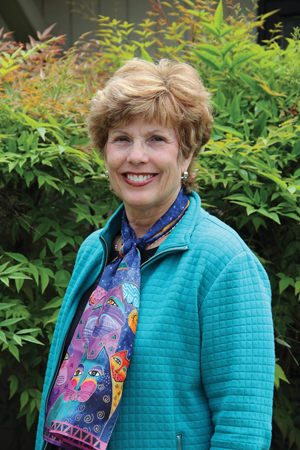 After 41 years of implementing and overseeing countless programs, classes and special events; facility installations and renovations; attending committee and board meetings; and connecting with residents of all ages, Director of Recreation, Parks and Culture Peggy Mark will finish the Montgomery Village chapter of her career. Mark is set to retire in mid-August. Peggy started at the Montgomery Village Foundation (MVF) in the summer of 1976 as a seasonal employee—the Summer Center Director at Stedwick Community Center. She managed one of three drop-in centers which ran five days a week from 1 to 10 p.m.—quite a difference from center hours today! After the season ended, Mark was hired full-time as a Recreation Specialist planning monthly meetings for various interest groups, working special events and managing the lawn theater concerts. Shortly thereafter, a new director—and new mentor for Mark—was brought on board. Mark credits Josette Baker as having a huge impact on her career and development. Under Baker’s leadership, Peggy was able to take opportunities and find new experiences that would develop into workable skills for future tasks in Montgomery Village, even though at the time, Mark’s sights were on a job in a larger recreation department. However, Mark says that Baker gave her one piece of advice that changed her thinking and kept her learning and growing with the Village: “Recreation in Montgomery Village will offer you a wide variety and a breadth of experience you won’t find many places. Working here will give you broad knowledge of how a department operates, rather than pigeon-hole you into one particular facet of recreation.” Mark took this to heart and hasn’t looked back since, turning special projects and programming challenges into learning experiences and teaching opportunities for other staff. Mark notes the biggest change over the last 40 years has been growth in the Village. A lot of her career has been dedicated to facility development, but she has also seen the Village grow in size, population, trends, needs and wants, leadership, opportunity and vision. Along the way, her career highlights include: helping develop the camp program; working with legislators on bond bills; forming specialized youth programs; and taking part in some exciting initiatives that had never been tackled before. Peggy is extremely proud of Milton M. Kaufmann Park, not just for the amenities it provides, but because of the work that went into it. This partnership park with Montgomery County was the first of its kind where the County Parks Department facilitated the use of Project Open Space funds to create a park on Montgomery Village Foundation-owned land. Mark was able to convince the county that this facility qualified for the funds and the park was paid for through money generated by tax dollars, not resident assessments. She is also especially proud of recent changes stemming from the Long Range Facilities Plan, including the Farmers’ Market and the renovations to MVF-owned pools. Mark says she thinks her favorite change over the course of her career is the nearly complete renovation of Apple Ridge Pool. This one stands out to her, not because it is fresh in her mind, but because it is such a significant deviation from the standard Village pool. She is very proud of how this pool is coming together and thinks this amenity reflects how the community has changed as well. One thing she won’t miss, though—worrying about snow removal during a winter storm. It will be nice to enjoy snow without worrying about program cancellations and snow removal at facilities! Congratulations, Peggy, on a long and impactful career with the Montgomery Village Foundation. Your dedication to the community has benefitted all Village residents and will be missed.